Ian McKellen's first professional stage appearance was in 1961, and in 1965 he made his film debut, playing a gay character in A Touch of Love with Sandy Dennis. He has been directing plays since the mid-1960s, and has received the prestigious Olivier Award five times. For most of his career he favored stage work over film, which is why his reputation as an actor perhaps exceeds his film résumé. On stage, he has played virtually every important part in all the classics, but not until 1981 did he find his first starring role on film, playing D. H. Lawrence in Priest of Love with Ava Gardner. He is most widely known as Gandalf the Grey in the Lord of the Rings trilogy. In Gods and Monsters with Brendan Fraser he played James Whale, the out and gay director of the classic Frankenstein films. Among his many other film and television roles, he played AIDS activist Bill Kraus in And the Band Played On with Matthew Modine, the title role in Richard III with Annette Bening, and Tsar Nicholas II in Rasputin with Alan Rickman. He played British politician John Profumo in Scandal, and said he took the role specifically to prove that an out gay actor could portray "a raging heterosexual." 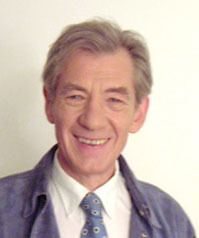 McKellen did not make a private secret of his homosexuality, but he outed himself dramatically during a live interview on British radio in 1988. The subject was an English anti-gay law, Section 28, and the host was Peregrine Worsthorne. Several times, Worsthorne dismissively referred to gays as "they" and "them", until a frustrated McKellen said in a pronounced stage whisper, "I am one of them." McKellen is the first openly gay Englishman to be honored with knighthood. Radio interview, BBC Radio 4, 1988. See also Gregg Kilday, "Ian McKellen & Wilson Cruz", The Advocate, 15 August 2000. He is asked if his decision affected his career, and replied, "I think anyone who argues that is just battling the homophobia within themselves. If anything, my career has taken off since I came out. And of over 20 film parts that I've played since then, only three have been gay. I don't think of myself as a queer artist, but I do bring my own gay perception to anything I do."